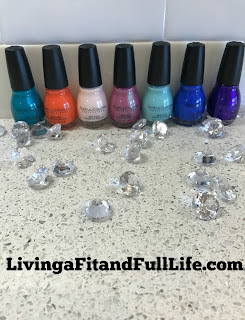 Living a Fit and Full Life: Fun Nail Polish Colors that Stand Out from SinfulColors! Fun Nail Polish Colors that Stand Out from SinfulColors! She's BOLD, she likes to STAND OUT, she BREAKS THE RULES, she chooses nail color to please herself—not others. Recognize yourself? So have untold and ever-growing numbers of other women. It's why they've become passionate devotees of SinfulColors. They know and love that we're a decidedly different beauty brand. One that reflects their unique personality, fashion sense and desires to a tee. Our story starts in 1991, when a team of visionary beauty experts developed SinfulColors for professional beauty stores. Their ability to anticipate the next "now" colors made an instant splash. In no time, SinfulColors spread its on-trend color appeal through retail stores and across the country. With vivid shades that pop, wow, flatter and inspire. In cream, glitter, shimmer and matte, and in formulas you want that provide full color coverage. All made in the USA, with the quality you expect from a leading nail brand, without formaldehyde, toluene and DBP. But what also makes SinfulColors such a runaway favorite is that our nail polishes are incredibly affordable. From the get-go, SinfulColors' founders didn't believe you had to charge an arm and a leg to produce and deliver show-stopping color. At a price as low as $1.99, SinfulColors makes putting the glitz on your nails a steal, not a splurge. Nails with bling are an easy and quick way to create your own look: the fabulous value SinfulColors offers (plus our huge variety of shades!) allows you to easily change your color to match your mood or look any time, any day. And with an unheard-of up to 20 new collections every year, all featuring the moment's and season's hottest colors, SinfulColors gives you even more reasons to make a statement about who you are. Thanks to SinfulColors fans like you, we've become the top name in affordable nail polish. Look for more excitement and products ahead, from the brand with the colors you crave at a price you'll love. Rock on in this strawberry shade with a funky green flash. I don't know about you, but one of the quickest ways to put me in a better mood is to paint my nails or toes. I absolutely love that fresh new color look and now that the weather is heating up and it's becoming sandal season my toes need to painted at all times. A new nail polish color is just like a new pair of shoes to me as it all adds to my outfit and makes my whole look come together. These nail polish colors from SinfulColors are perfect inspiration for a new summer outfit. Each nail polish color adds a nice pop of color that is sure to be noticed. SinfulColors nail polish colors are some of my all time favorite nail polish colors but I also love how smooth the nail polish itself is. SinfulColors nail polish is the perfect way to get a professional looking at home manicure or pedicure that you're sure to love! Click HERE to find a store near you that sells SinfulColors! Click HERE to learn more about SinfulColors! Follow SinfulColors on social media!